Check out Mr President looking radiant as he received some governors at his official quarters, Abuja House in London today. For heaven sake,this man look too frail and incapacitated to handle any political issues of his country-Nigeria. The president need to be seriously advice to quit politics altogether in order to save his life. Those pushing for his stay in power are his enemies who want him dead before his time. Anyone who has an eye will know that Buhari is still very much unfit to handle the weighty responsibility before him. Endurance, you visually assessed this man as unfit to carry out his constitutional duties but the doctors know better. That was why he was being delayed by the medical expert to receive a full treatment before going back to his job. If the doctor says he is okay, why do think your own visual assessment can override doctor’s opinion. At times it takes time to recuperate when someone falls sick. Aside this, Buhari is not our problem right now. Osibajo already filling the vacuum. He is doing what Buhari should be doing and that is why we have VP. It is very disheartening to see some people killing this man with mouth. God does not think the way we human think. What happened to late Yardua may not necessarily happen to Buhari. If God wants Buhari to go for second term, there is nothing anybody can do about it. What I expect the house senate to do now is to start working on how to pass Electricity bill, how to broadening our Agricultural sector, Education bill etc. Instead, they only engaging themselves in how to install Saraki as their next presidential. Let us leave this man alone at least for now. You never see anything wrong about those cabal who killed this nation. You may not like this man being a Fulani but non Fulani’s are worst if we vote them in. Why is he sit down for corner chair? He de fear the chair? Only him is sit down for chair and he come sit for corner like say other pipuls is follow sit down weyris no want shift for him. , then let God’s Name be praised. However, this pix looks like a frail figure, a mere shadow of what PMB used to be. I doubt how far he could go with this frame in ruling this country. He should please give a thought to resignation. That would be a virtuous and an honourable thing to do. I remember him calling for the impeachment of the late Ya’Adua back in 2010 on the grounds of health. If ever he is a man of integrity, he should not wait until he is impeached or some fatal fate nudges him off his seat before he quits. British can do anything to keep Nigeria in disarray and darkness, they can even clone someone. 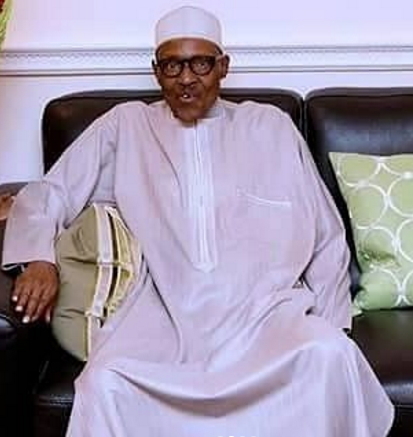 As much as i am wishing PMB well and good,if this is truly him,please let cabals leave this man alone to enjoy his old age with his family,he is not in condition to direct the affairs of Nigeria,though Nigeria is dead already. please lets allow this man to recover very well before asking him to come back. he is not fit yet to come back, please allow him to be healed properly before talking of returning. Nigeria is not running away, so Mrs Buhari please do not allow anyone to deceive your husband. it is better he resign and be alive than been dead because of stress of this country. @jilo your reply I just read through really amazed me. 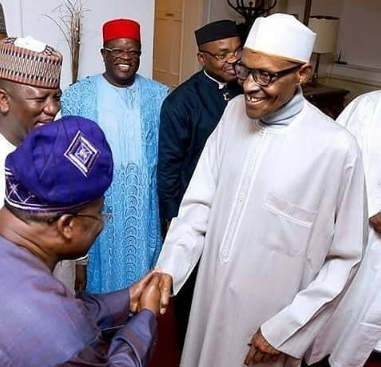 Even someone with a very poor eyesight will clearly see from the picture above that Buhari is physically unfit for now to handle the mantle of leadership in a problem-filled country called Nigeria. That the UK doctor certified him OK to return to office doesn’t mean he’s physically ok for the strenuous job attached to the presidential duty set before him. 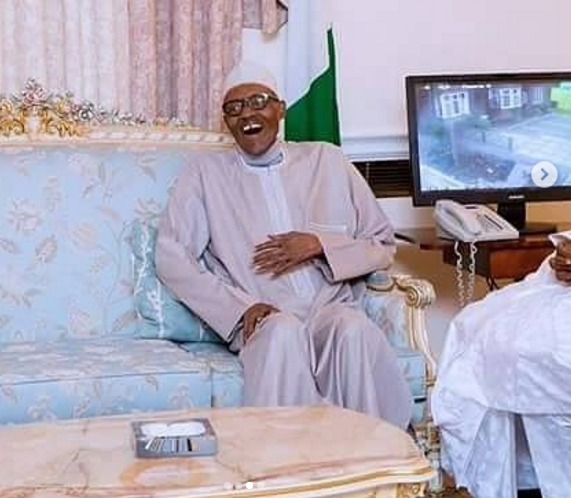 Was it not the same UK doctors that confirmed that president Muhammadu Buhari could now resume office,then after coming back and spending some few weeks in Nigeria,was eventually flown back to UK for more treatment? UK doctors are human like you that are not perfect. Sometimes they are prone to (medical mistakes). No matter how medically advance they are,record shows that some who are rushed to their country for advance medical care lost their lives in their hospitals. Does that not show to you that their is limitation even in medical field, that their is no 100% percent assurance in what medical expert tell us? No sane person of course will wish Buhari dead. But what I think every thinking person with human feeling need to be concern about is how this man can keep a safe distance from politics and take good care of his health. EMI O LA ARO. So the Yoruba adage says. If you were his younger brother,I firmly believe you would have advice him to quit politics by now or at least get a longer period of rest before his resumption to office. So do not view medical expert as God that has the final say. Their are bound to be inevitability of “human error” in medical field. I want you to get that very clear,alright? Endure, I may not have a good eye to see this situation in your own perspective but i have a good insight to know that Buhari will never give up on those Cabal to bury this Nation while the people inside are still breathing. Buhari is well enough to continue his job as commander in chief. If he fells he is not capable to handle the affairs of this Nation, he will definitely quit. We don’t have to crucify him on media. Senator McCain of United States went back to work within a week after having a brain surgery to make his impact on Health Care bill. Nobody stops or advised him to go and heal himself completely before coming back to Senate. All we need to do now is to rally around this man and work with him in order to resuscitate this Country. The Cabal have tried enough both in Spiritual and real world just to make sure this man die in order for them to continue their looting but God has shame them and disappointed them all. If this man never proclaim his incompetency, i think we should leave him alone to complete the job he has started. Osibajo has already been keeping the ball rolling. You cannot speak for this man. Do not have this notion that Buhari is fighting corruption in a way that will revive Nigeria if that is where you are trying to drive home your point to keep a frail man in power. Little appreciate his mode of anti corruption war that has largely remained lopsided and not include all corrupt government officials among the political parties. Many corrupt members in his party have been left untouched while he wage his anti corruption war only on those who are no part of his cabal. Is this how corruption is been fought in the US where you are? In an attempt to conceal themselves from been exposed, many hardened corrupt PDP government officials have played a political game by switching over to the ruling party and are not just being welcomed into their midsts but given key roles to play in solidifying their party against the 2019 general election. Many things have deeply gone wrong with his administration. All I care about is that he should take good care of his health and not allow politics to ruin his life.